January | 2011 | BONKERS IN HONKERS! Rosedale on the Park has been on my radar for a while but for some reason we just never ended up going to it…until tonight! It promised stunning views and happy hour drinks on their website and it duly delivered. The Skyzone Bar and Restaurant is all the way up on the 33rd floor. Decor is a bit “The Shining” (and the music was in accordance with the decor at times) and the service a little lacklustre at the start when we were the only ones in the place but the service improved as the night went on. I think our bill was about 300HKD for salad, garlic bread, pasta main, dessert and 2 beers and 2 wines. 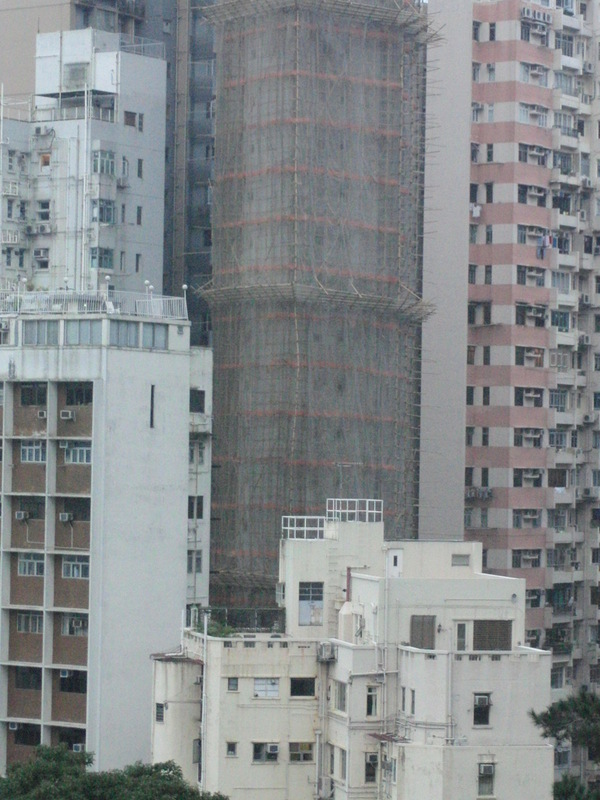 Pretty good for a hotel in Hong Kong! And, you know what? The food was really good! The bread was fresh and hot, the mains were tasty and just the right portions and the ice cream for dessert was, undoubtedly, “home-made”. The views are pretty, prettayyy good. It’s a strange vantage point that you may not see as a visitor to Hong Kong; looking over Victoria Park, HK library towards Tin Hau. Normally people get to places to look over the harbour or down towards Central. So it was a nice change. And going in to the men’s bathroom you are met with another interesting view and quite a…strange bathroom experience! Here’s a little stitched together panorama from the main bar area. Click for biggy! After only experiencing one hot pot eating event once before I was eager to try it again. Especially as the first one was bloody vegetarian!! 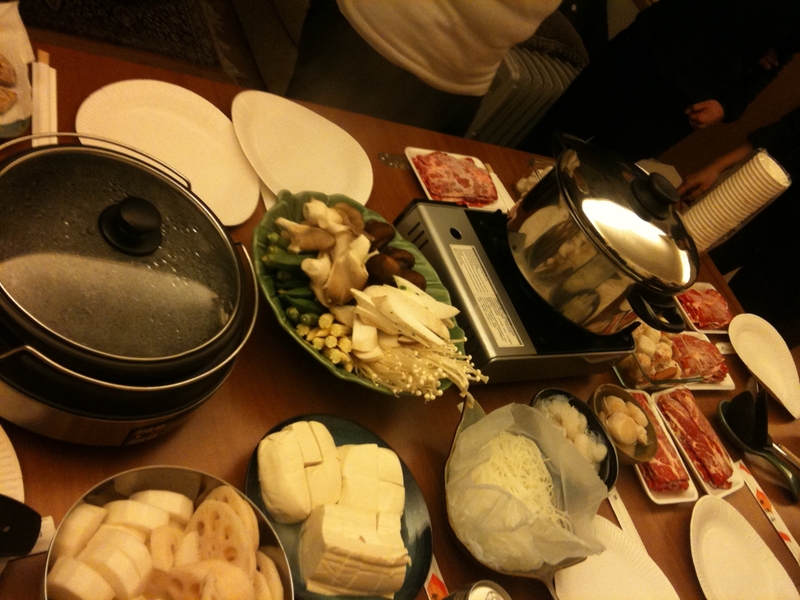 So I was very happy we were invited to a very meaty hot pot event in a colleague’s apartment. 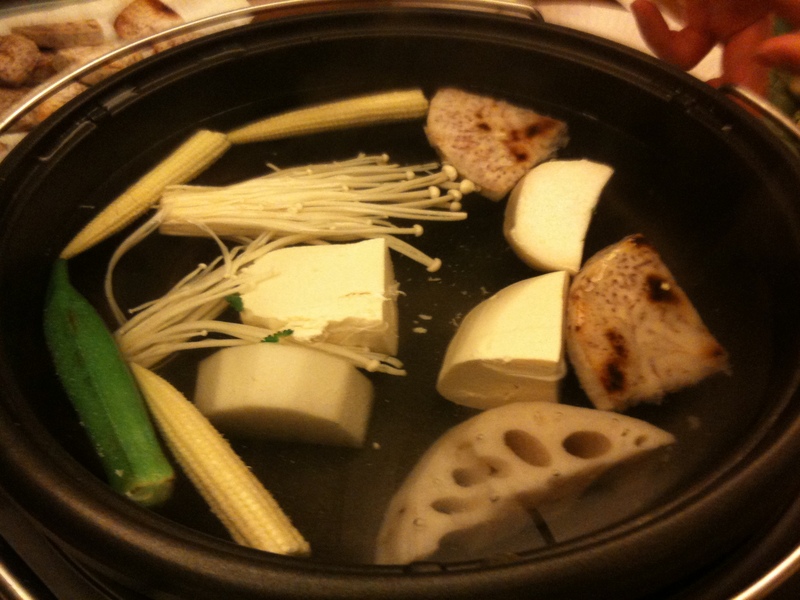 Basically hot pot involves a pot of boiling water, raw vegetables and meat. And an accoutrement of sauces and spices to mix together as your dipping concoction. It’s a very communal, social affair with everybody ladling out various things to people who can’t reach the bubbling broth of earthly delights. This was my smorgasbord of sauces. 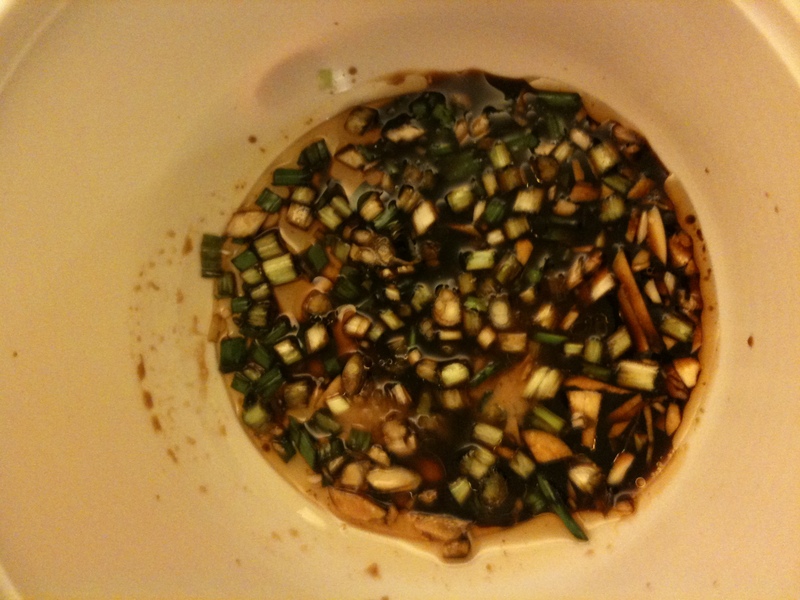 I like soy so I had two types of soy, some spring onions and a little sesame oil. It was niiice! 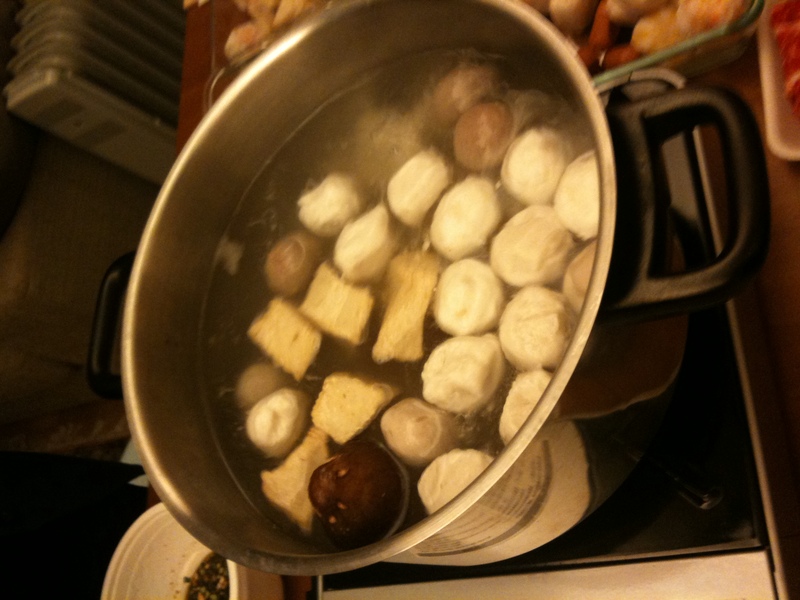 Various fish balls, beef balls and tofu bits. The pot for veggies only. VEGGIES ONLY!! Pre-dipping into my special sauce. Yum! 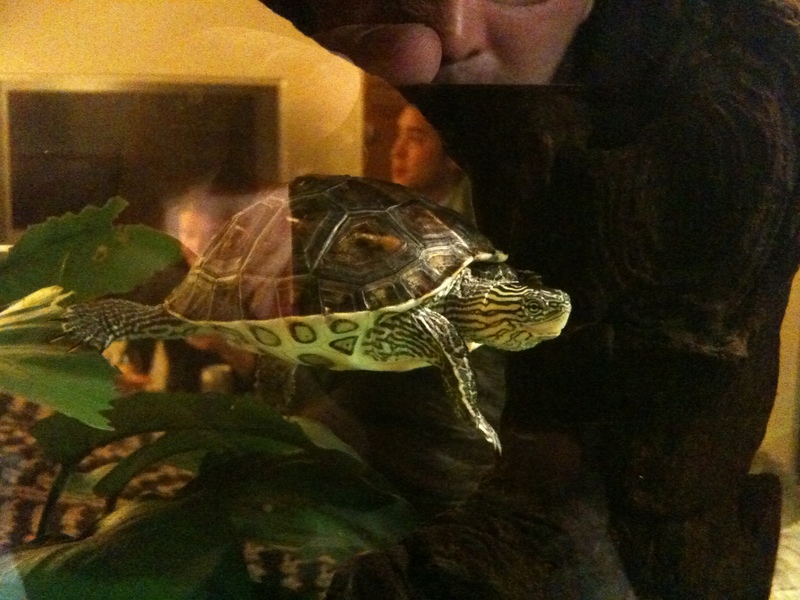 The other entertainment of the night was our friend’s aquarium. 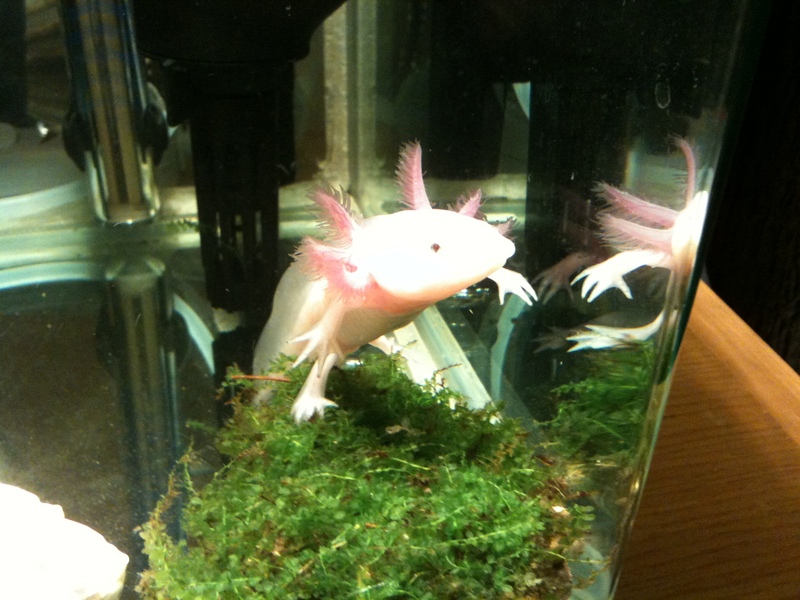 I love a good aquarium and could stare at one for evvahhh. If you’re heading down to Bangkok from Hong Kong for whatever reason you can get the most reasonably priced flights on, strangely enough, Emirate’s sparkling new behemoth double-deckered Airbus 380! I’ve wanted to fly on this bird since I watched its maiden flight live streaming back in 2006/2007, I can’t remember exactly. On board, it’s got great leg room; you are actually disadvantaged sitting at a bulkhead row as you can’t watch your TV while taxiing, take-off or landing. And the extra leg room is minimal. Emirate’s entertainment system is also full of stuff to keep you entertained. Flight times between HKG and BKK are only about 2 and a half hours anyway. 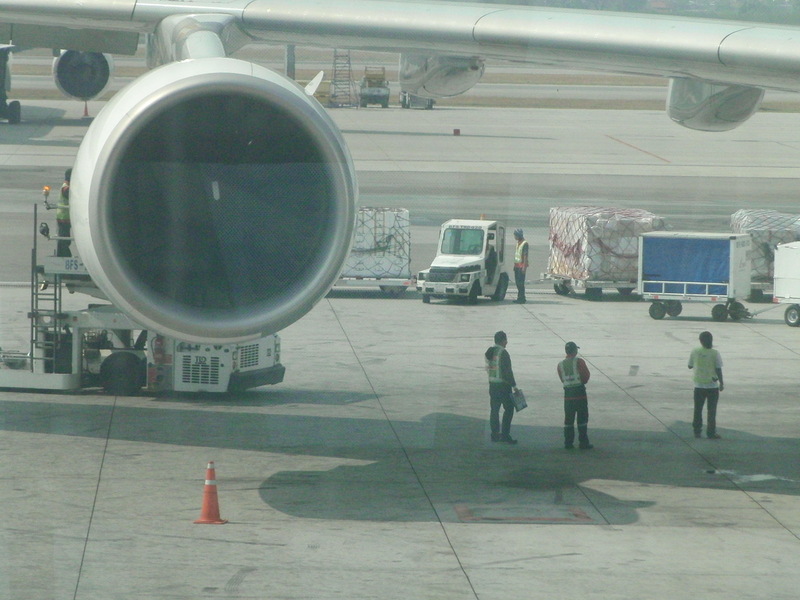 The downsides of flying this size of plane is the extra bodies on board, everything takes longer and is more stretched out due to the numbers involved. We were delayed both going and coming back and I’m thinking this is quite regular. The more the people the more the chance of things messing up! You can really feel the sheer weight of the A380 when turning and taking off. 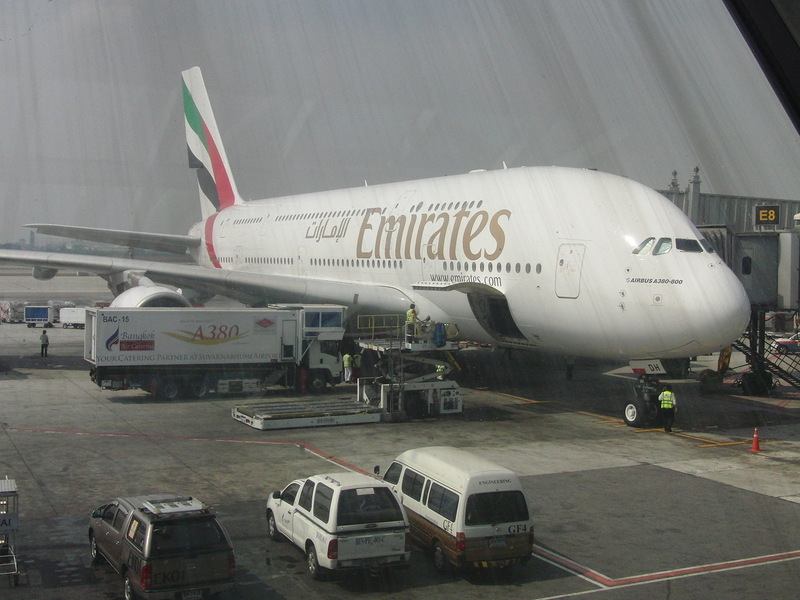 It’s a great experience and if Emirates keep their prices low then it will be number one choice for many people doing the Bangkok route from Hong Kong. 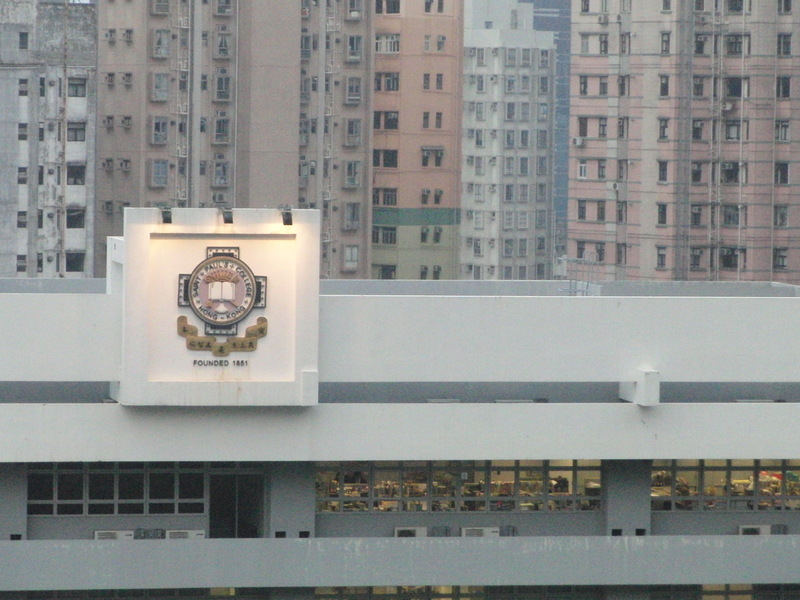 I’ve being going to HKU now since September 2009 on a 2 year part time gig for my Post Graduate Diploma of Education. I finish up the whole shebang in May. Forever. God knows if the PGDE will have any monumental standing outside of Honkers. 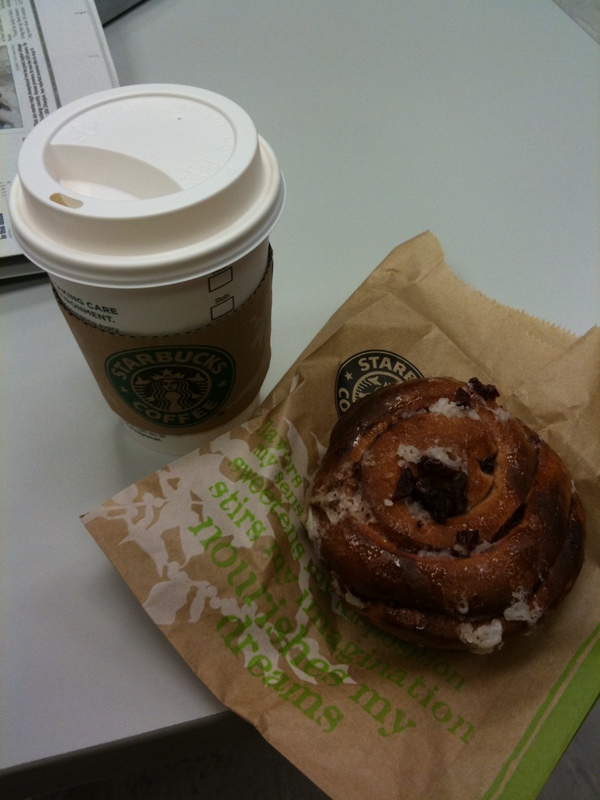 The overwhelming high point of my time at HKU has without doubt been…..the cheapest Starbucks in Hong Kong!! Yes for $35 HKD all this could be yours too. I seriously looked forward to this every week. They don’t card you either so yes you can just be a normal skinflint and get some cheap Starbucks too! For your information in the first year of the PGDE at HKU you gotta go on a Tuesday and Thursday night from 6-8. Now in my second year I only have to go once a week. It’s been…an experience. There was a dead cockroach on the staircase leading up to my class for quite some time. A few weeks ago it disappeared…I miss it. If you ever go to HKU prepare for stairs and elevators; it’s all levels Jerry. Levels. It’s a very easy university to get to though with numerous buses running right past the gate so that’s been good. I’m getting my Masters somewhere else. WordPress kicked my behind when it sent me that email with the stats of bonkersinhonkers. It did exactly what they wanted it to do; it got me at least to think about blogging again. 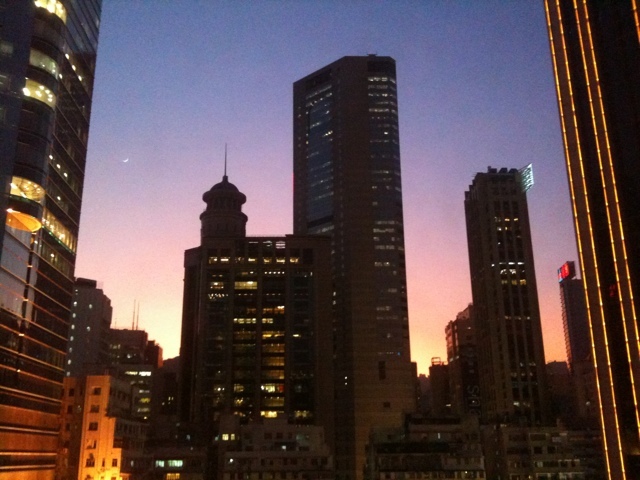 We are in our third year here in Hong Kong. Life has a habit of just being routine. Here we are in one of the most exciting cities in the world but when you throw in a 07:30-16:30 day job you become part of the normal working day life everyone has around the world. 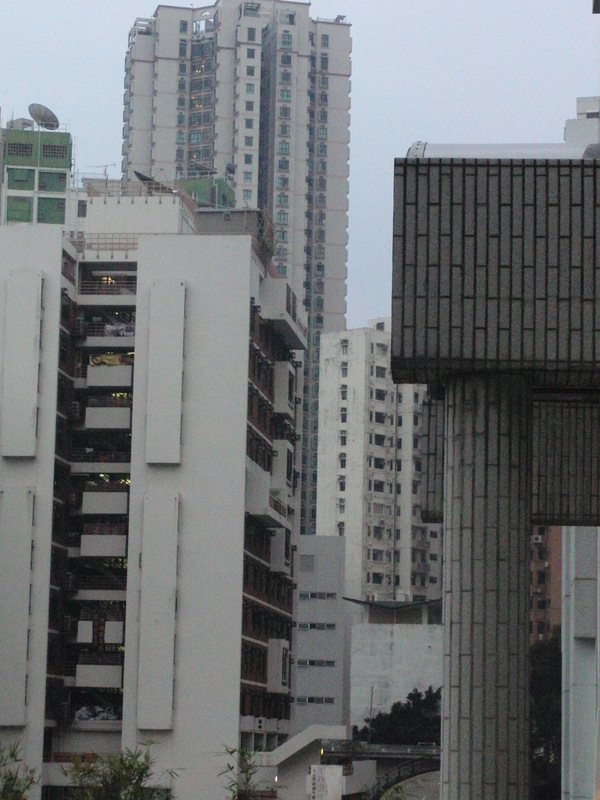 We travel back and forth to work in between towering apartment blocks, past local eateries, go through a tunnel through the middle of Hong Kong island and we get on with our lives. My family always ask me where the updates are to Bonkers and I look back and the last one was in September; that’s life getting in the way right there! For sure, I find myself wandering the streets of Causeway Bay at times slaloming through the sea of humanity looking up at the awesome buildings old and new and realise how awesome it is to live here and to be experiencing what I am. I know people find it interesting what we go through but it’s hard for me to find it interesting enough to blog about after two years. So I need to get back to basics. 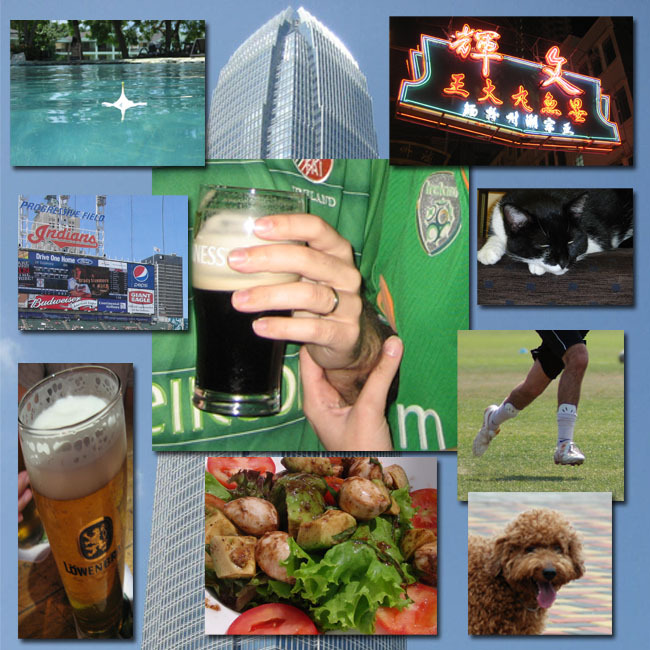 I need to think about what people who have never been to Hong Kong would find interesting or at least semi-interesting. I look at the Cleveland SGS blog that I know very well and find the various scenes of Cleveland fascinating and I think I need to be doing the same here. I will try. With a kick up the backside and a fresh perspective from WordPress, Cleveland SGS and also the 365 Project. I will try. Which leads me on to this mess of a lunch and a passing nod to my recent foray in Hot Sauce Williams in Cleveland. 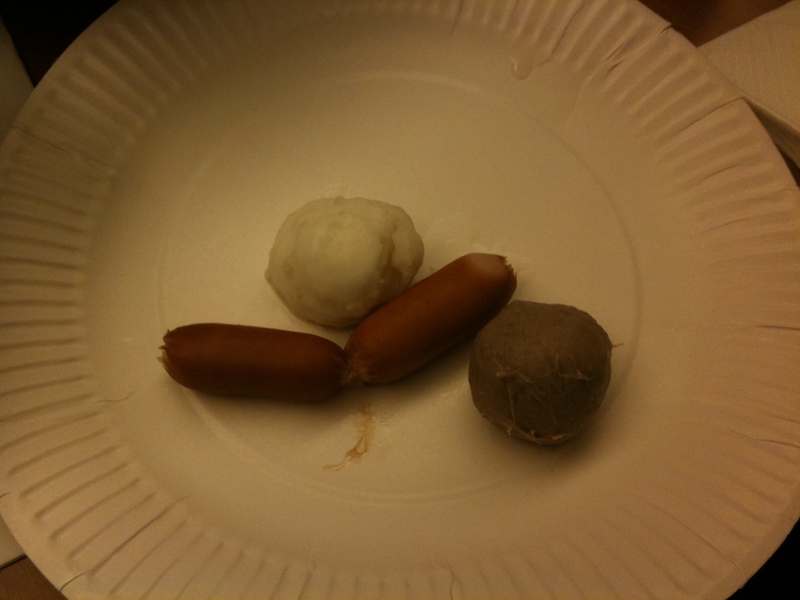 I get this delightful tray of earthly delights quite a lot from the International store at Cyberport. 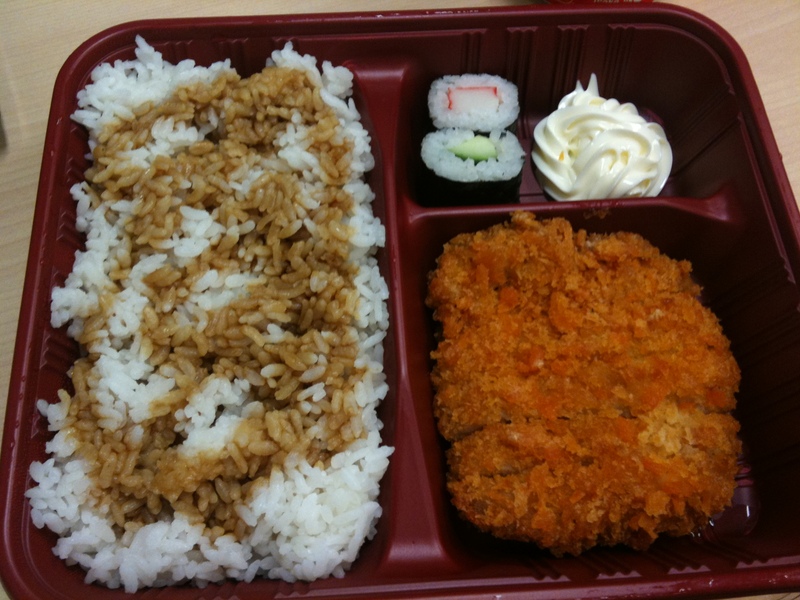 It’s breaded and fried pork, a dollop of mayo, two sushi rolls (this varies every day) and a slab of boiled rice with a Jackson Pollock helping of a soy sauce type thing all over the top. It’s lovely and fattening and delicious and it’s about $25 HKD which is about $3 USD/2.50Euros. I’m a disgrace, I don’t care what WordPress says!! In 2010, there were 11 new posts, growing the total archive of this blog to 129 posts. There were 14 pictures uploaded, taking up a total of 11mb. That’s about a picture per month. The busiest day of the year was May 3rd with 156 views. The most popular post that day was Junk Boat Trip. 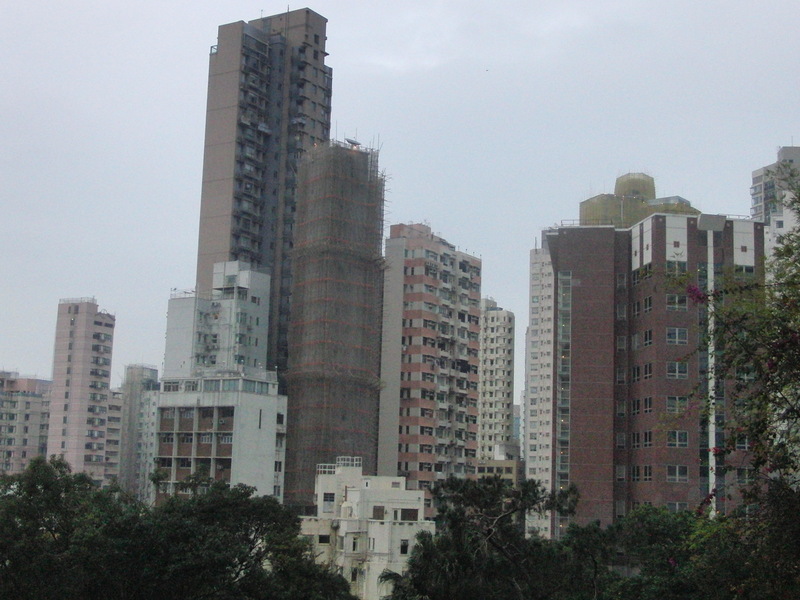 The top referring sites in 2010 were hongkietown.com, lolainhongkong.blogspot.com, lusophoneworld.blogspot.com, ulaca-es.blogspot.com, and rpc.blogrolling.com. Some visitors came searching, mostly for honkers, bonkers in honkers, honkers in bonkers, 500 hennessy road, and happy easter.